The acting isn’t just wooden, it takes wooden to a whole new level of flat and unbelievable. It’s actually almost enough to believe it’s bad on purpose, but I just don’t have that much faith. The shots aren’t framed for maximum impact, but possibly to reduce money spent on film. I mean, there is literally at least one scene where two characters are both in shot, talking to each other in a turned half-to-each-other-half-to-the-camera pose that a lot of theater directors avoid because it looks too ‘stagey’. I’ve seen better special effects in high school projects which were being made at the SAME TIME as this movie. More than once, two characters went into a room just to say some sentences that meant nothing and then agree to go somewhere else. It was baffling how unmotivated most of the lines and actions were by any sort of logic or even internal character emotion or desire. All the costumes are the most obvious choices. There is a wife and mother who starts the movie dressed like a Stepford robot with pearls and frilly apron, the ‘bad thugs’ have the sleeves ripped off their shirts, and there are ‘elves’ who mostly look like they were dressed at a Party City. But what, you ask, is the subject matter of this pile of cliches? Used car salesman Gordon has promised to take his wife and son [somewhere? out of state?] for a white Christmas. His sleazy boss reveals that if he stays and really works to sell a ton of cars by Christmas, he could end up head of the multi-lot operation. He agrees to do it, which makes his kid cry and his wife angry. Like… spousal abuse angry. She grabs his tie and half forces him to the ground. It’s weird how it comes out of nowhere. Kid, incidentally is WAY too old to believe in Santa, but does anyway, because…? (Even Erin agreed this kid was too old for Santa.) 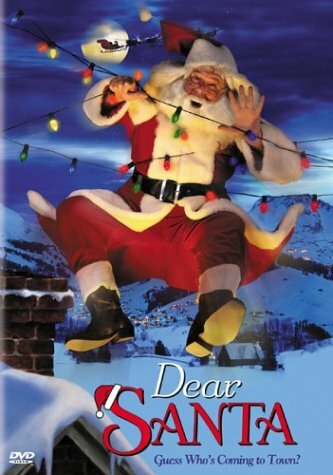 ‘Teddy’ writes a letter asking Santa to help his dad find the Christmas spirit, and Santa obliges, so an elf starts haunting Gordon, telling him he’s now a “Secret Santa” and he has to act the part. Side note: one of a very small number of special effects: the elf can (mildly?) electrocute people. Yes, she looks like a low-rent Palpatine when this happens. Gordon keeps compromising his morals in pursuit of the job, even as he starts a Tim-Allen-esque Santransformation. Wife, Carol, threatens to leave him. Teddy tries to get them back together, with help from his friend Margo, here playing a junior version of the ‘wise black character’ stereotype. Elf-lady shows up in a dream as a drill sergeant and smacks Gordon until he gets his ‘Ho, Ho, Ho’ right. Gordon uses the Santa look to play into his schemes to sell cars, and it comes down to the wire. Gordon accuses his boss of selling stolen cars. Said boss knocks Gordon over the head and sticks him in a trunk. This would have been a neat, dark place to end. Instead, the movie keeps going. Instead, Gordon somehow ends up at the North Pole, as helpfully explained by the most hideous “owl” “puppet” I’ve ever seen. 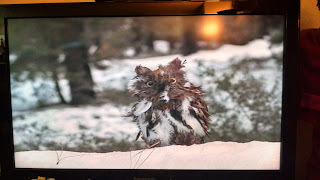 Seriously, this thing was sad. The head rotates a little, that’s it. Then there’s a lot of walking around sets that they don’t own (it was filmed at a Santa’s Village in California) and a lot of explaining Santa business. It boils down to lots of unpaid elf labor, a bunch of kidnapped guys like Gordon and some fancy tech. This is a racket. Actually, someone should write the version of this where Gordon uses his salesmanship to take over and reform the operation. All the elves are women. Most are young, all of them are conventionally attractive. Most are wearing leggings or tights and very short tunics. This movie was REALLY WEIRD for a family comedy, is what I’m saying here. Gordon delivers some percentage of that year’s gifts, which is stupidly easy, then takes his kid for a ride (after his wife has said she’s leaving him. Can you say parental kidnapping?) and uses his elf backup to make a citizen’s arrest of his boss and the goons. At this point I was just saying “What? What? !” over and over. And those two characters walk out of this movie and into quite another genre. Which makes perfect sense, actually. You see, despite the fact that almost none of the actors in this are credited with anything else on IMDB before or since, the director has had a long career, under multiple names. A career making shlock. First sci-fi and horror, and then a long prolific career making soft-core films, mostly with the word ‘bikini’ in the title. He has also continued to make a small scattering of family Christmas films.